Gemini and Aquarius get acquainted at the level of reason and immediately penetrate with love for each other. Both of them are pleased with the refreshing influence of each other, they willingly hold sessions of numerous questions and answers. As a parent, Aquarius extols life philosophy, in which there is no place for dishonesty, fear and emotional traps. Aquarius, a sign of water, will always induce Gemini to look afar, think broadly and easily go through life. To tune in to the wave of Aquarius, one must be prepared for a constant change of frequencies. Sometimes Aquarius can seem unattainable, and although representatives of this sign of friendship are usually surrounded by people, they often look detached and lonely. 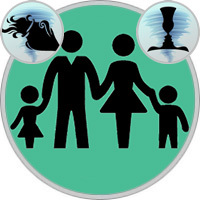 Parental responsibilities raise the issue of intimacy and unification for Aquarius. He likes to establish relationships on his own terms, but does not fit into the role of husband, wife, father or mother according to what people expect from him. In essence, Aquarius usually turns most family relationships into bonds of friendship, as it understands them in this way. Gemini sees in his parent Aquarius primarily a friend and like-minded person. Being an air sign, the Twins appreciate this relationship most of all. The Gemini Child is trusting, he freely hangs with thinkers and amateurs to talk, and the original style of Aquarius’s communication admires him. This couple is most like talkative friends. True, my mother loves not only to talk, but she is also ready to play the role of an enthusiastic audience for her Gemini when he is in shock. And she has a very broad nature, so that Gemini will be delighted with unexpected gifts like new books or a designer that are designed to occupy his witty mind. The mother is happy to give her child the urge to learn. True, it can show much greater interest in social problems and politics. She will try to attract this and her child - Aquarians love that their children develop a social consciousness. However, Gemini will be worried about his own needs, and he believes that first of all he should not be bored. These two live more wisely and depend little on their own emotions. Strong manifestations of love are not for them, although they, of course, are very attached to each other. Aquarius likes that her Gemini child does not stop her from living her own life, while Gemini is happy that the mother allows him to spend free time with friends. Mom-Aquarius is very sociable - in this they are similar. True, she is one of those who like to be a part of a group, especially if it is for the benefit of people. Well, Gemini simply brings joy to have numerous friends, among whom he could shine. These two share a love for everything new and easily adapt to change. Both are capable of brilliant ideas, only the mother knows how to better implement them, and she will help Gemini figure out which of his plans will work. Aquarius appreciates Gemini’s ability to clearly explain, and she does not mind that he argues too much - she finds such discussions entertaining. True, she would like her child to always adhere to the truth, as she herself does... Well, her child-Gemini believes that he just got lucky with his mother! The inventive dad Aquarius enthralls his little Gemini, offering him the most incredible plans. Father is very original, sometimes too much, but Gemini likes it - it’s much better to have such a father than boring and similar to everyone else. Aquarius develops the living imagination of Gemini, instructing him to compose a story or paint a large picture. He will encourage the development of the speech of the child, not sparing time for conversations. And since there are always a lot of books in the house of Aquarius, the Gemini child can start reading early and generally learn. Sometimes Gemini is indecisive or awkward, but it does not bother the father, because he sees this as a sign that the child is growing up and learning to be responsible for himself. Aquarius believes that children should develop naturally, without strict discipline, and Gemini is quite happy with it. He likes that his father sees him as he is. Aquarius still have to follow, so that Gemini is not too overwhelmed: it’s a little cunning, who will "adjust" the rules in their favor - and indeed the truth too! But Aquarius knows how to explain to children what is good and what is bad, so there should not be any problems. Gemini is proud of the fact that his father is keeping pace with the times and knows so much. Well, Aquarius loves intelligent children and will gladly supply the inquisitive little Gemini with fascinating information. This child has an inexhaustible interest in life, but his father will have answers to all his questions!